[SatNews] Marlink and Vizada have instituted a significant expansion of Marlink's contract with one of the world's largest shipping companies, AP Moller-Maersk. As part of the renewed agreement, Marlink will provide Inmarsat FleetBroadband airtime services to an additional 200 vessels, increasing the total number of AP Moller-Maersk vessels sailing with FleetBroadband airtime to 370. Vizada will enhance the Inmarsat FleetBroadband service further by providing key Vizada Solutions to allow cost-efficient communications, such as web compression and filtering. Inmarsat FleetBroadband is the first maritime communications service to provide broadband data and voice, simultaneously, through a compact antenna on a global basis. The future of a successful shipping business requires a stable communications platform, and FleetBroadband provides that assurance. The new web compression and filtering solution of Vizada will help to filter and prioritize Internet and email traffic, in order to maximize efficiency of the communications network. 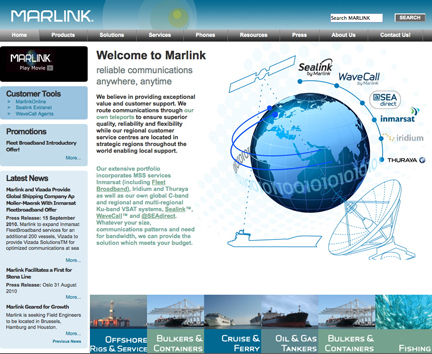 Marlink's strong partnerships enable APM to enhance their operational efficiency and establish low-cost crew welfare communications.